For urgent care, LAX and surrounding areas offer a few options, but none are as convenient or effective as House Call Doctor, Los Angeles. If you're suffering from a life-threatening emergency, never hesitate to contact emergency services by dialing 911. However, for a variety of illness and injury needs, Dr. Michael Farzam and his House Call Doctor Los Angeles team is always an exceptional choice for urgent care at LAX at throughout L.A. When seeking out a first rate doctor, house calls are rarely even considered as a possibility these days. To most the thought of a doctor making house calls seems like a throwback to a previous era, when warm, empathetic care was the norm. Today, when people are on the move more than ever before, it only makes sense to save time while avoiding costly urgent care clinic visits or hospitalizations by opting for a first-rate concierge doctor. At LAX, there are a number of hotels and corporate buildings – and, of course, a great deal of traffic. Fortunately, Dr. Farzam provides hotel and corporate services with the same level of intensive care that he provides as L.A.'s foremost name among house call physicians. The renowned doctor and his team specialize in treating the sort of ailments that commonly afflict travelers to and from LAX, including acute illness, headaches, high blood pressure, abdominal pain, travel clinic medicine and related immunizations and much more. 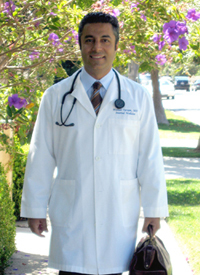 Dr. Farzam has been voted "Best Doctor" and has received "Patient's Choice Award", "Patients Recognition Award", and is board certified in General Internal Medicine by the American Board of Internal Medicine, among many other accolades. With such an illustrious past, is it any wonder Dr. Farzam is the specialist for urgent care LAX travelers and nearby residents can trust for first rate service? We think not! If you require medical care at LAX or any Los Angeles neighborhood, you can contact the House Call Doctor Los Angeles by dialing 310-849-7991, and look forward to one-of-a-kind care.